You can import an image sequence stored on the Harmony database. From the top menu, select File > Load from Database. Note that Harmony Essentials cannot connect to a database. This option is only for Harmony Advanced and Harmony Premium. The Database selector dialog box opens. Select the environment, job, scene and element in which your frames are located. Select one or more frames to load. The Load Playback dialog box opens. ‣ Select All: To select all the files in the list. ‣ Select Loaded: To reload images that are already loaded in the player. ‣ Select Changed: To reload only the images that were modified since they were loaded. ‣ Select Unloaded: To load all the images in the list that are not currently loaded in the player. 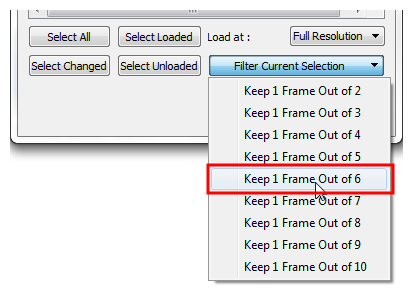 ‣ Select an option from the Filter Current Selection menu to select a series of frames from the ones selected. For example, to load one of six frames instead of the entire sequence, select Keep 1 Frame Out of 6 from the drop-down menu. In the Load At menu, select the image resolution. To load images faster, or to fit them on your screen, load the images at a lower resolution. Click Load to load the selected images. Once the images are loaded, click the Play button to play back your image sequence.